Finally in June this year Janet and I got the chance to travel to Yellowstone and the Grand Tetons together. Janet was there on a longer road trip, but we spent several days together at Old Faithful and Norris Geyser Basins, as well as at Colter Bay and the Laurance S. Rockefeller Preserve in Grand Teton National Park, and then some time in Gardiner and Bozeman, Montana, too. No doubt we will gradually share some of our adventures over the coming months. 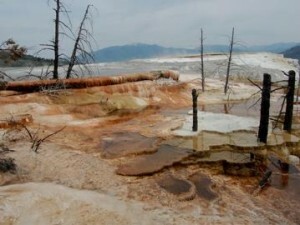 One day I drove back to Mammoth Hot Springs on my own. The story I am ready to tell is the hike I got to take from the Mammoth main terrace to Narrow Gauge Terrace. Enjoy! I experienced supreme satisfaction plunging into a basin whose waters were an exquisite 30ºC [86ºF]. My bath was a meter deep. The siliceous efflorescence that lined the interior walls seemed like velvet cushions. I remained perfectly still for a long time in this delightful bath, allowing my body to be pervaded by the invigorating influence of those waters, gentler to the skin than the softest comforter and as agreeable to the taste as to the touch. While I was reveling in my bath, I became aware of the augmentation in water level following a sudden rise in level in a higher spring, and, to my great horror, I noticed a neighboring basin that had been completely dry was now flooded by the rise. Now, it was in that basin that I had put my clothes, my boots, my towels. One must have suffered a similar ordeal to understand what deep despair can arise from the smallest accidents. The proximity of the hotel consoled me in my misfortune. Our book will be available in May 2013 in hardcover and e-book versions from the University of Nebraska Press. This time I want to write about three separate subjects that only relate to my recent  trip to Yellowstone because they center on people in the park. First, I want to publicly thank Yellowstone’s Park Historian, Lee Whittlesey. He has been encouraging to me about all my projects relating to the park and has helped me immeasurably to find what I’ve needed and to understand a great many things. 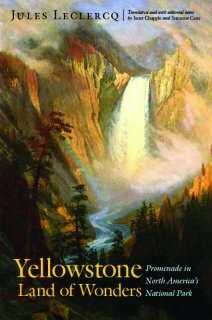 I’ve gone to him with questions ever since 1995, when I began research relating to Yellowstone. This month he supplied a strong shot in the arm to the project my colleague Suzanne Cane and I have been working on for over two years, a translation of Belgian travel writer Jules Leclercq’s beautifully written 1886 French book called La Terre des Merveilles or The Land of Wonders. His help and enthusiasm are propelling us forward. What an amazing guy he is! Next I’ll mention the delight I felt when, by chance, I got to meet USGS geologists Bob (“Chris”) Christiansen and Jake Lowenstern while waiting for Fountain Geyser to erupt. These two were presenting interesting geological remarks to a small group of people that turned out to be a field trip from the group Geologists of Jackson Hole. When they were about to leave I got up the courage to introduce myself and my husband Bruno Giletti, and they were both most cordial. These are two of the most important contemporary researchers into Yellowstone-related geologic questions, and I have known about them for many years, so it was a pleasure to finally meet them. Lastly, at Mammoth Hot Springs in previous summers I’ve been able to consult the rangers’ logbook to learn what the various springs and terraces have been doing since the last time I was there. Now, I learned, there is no longer a logbook, and, as far as the rangers at the information desk in Albright Visitor Center could tell me, no one is keeping track for the park of where there are new springs, which ones are most active in building the travertine terraces, or any other current data about Mammoth’s remarkable features. If this is so, it is really a shame. I suppose it is directly related to lack of sufficient funds to have enough park service personnel to do all the things that should be done, and this type of study is a low priority. 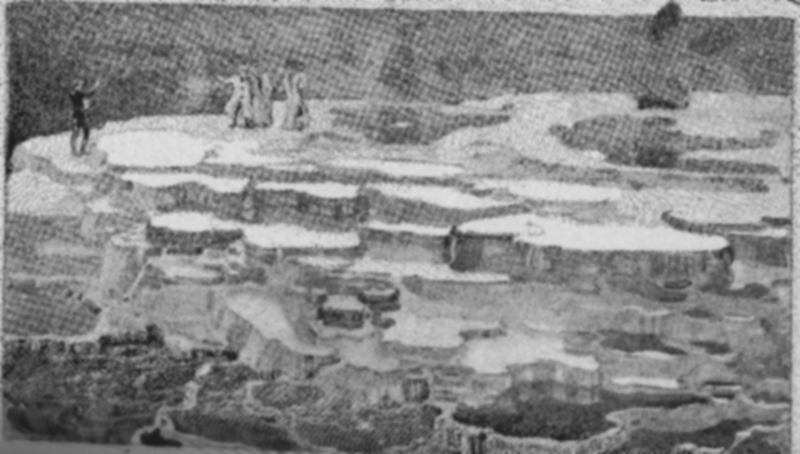 But the geysers all over the park have their own non-governmental group called the Geyser Observation and Study Association, with some 250-300 members. What about these unique hot spring terraces? I would love to be able to help personally with reviving the data collection on thermal features at Mammoth. Maybe in the next life. . .